Floor plan design analysis is a great way to find out more about a home but the floor plan is only as good as the information it has on it. This page tells you what information to expect on a floor plan (both indoor and outdoor information) and what information you can add to it to make it more useful. For making notes on the floor plan it's a good idea to print it out. If you’re into your technology take a copy of the floor plan design and use your favorite note taking software. 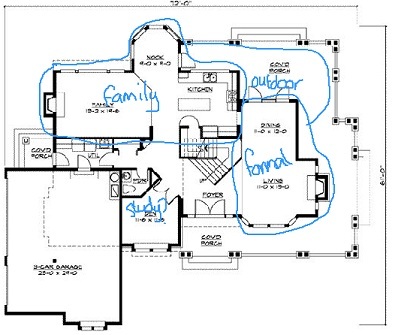 I like to use an electronic pen and tablet to scribble on top of floor plans. 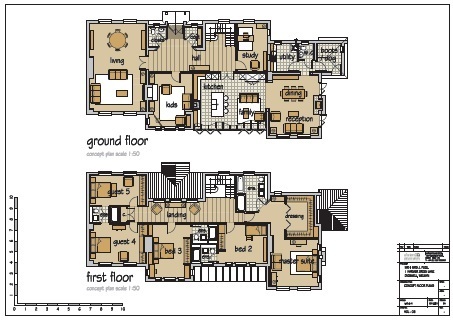 Look for the dimensions of the rooms of the floor plan. Sometimes there is a scale that you can use to determine the dimensions. If dimensions or a scale aren't available on the plan itself they might be available somewhere else in the information and you can write them onto the floor plan. 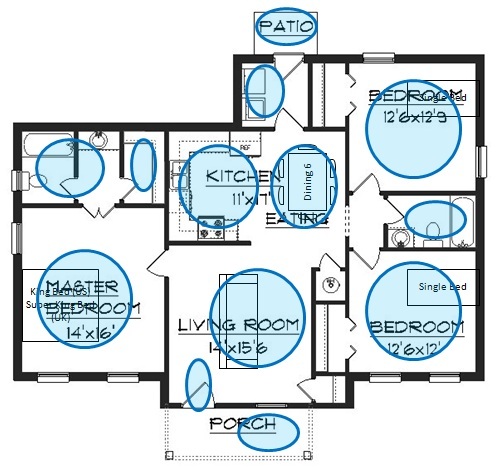 Make sure you have a floor plan for each floor of the home. Make sure there is a furniture layout on the plan. You’ll be surprised about how many problems can be uncovered in a floor plan when you bring furniture into the picture as well. If there is furniture on the plan take a moment to check its scale. Is the sofa on the floor plan really the size of a big comfy sofa or is it heading towards the size of a bus shelter bench? If there is no furniture on the plan put some in roughly to scale. The floor plan symbols page will tell you what all the symbols mean. Just like furniture the kitchen and bathroom layouts are essential bits of floor plan design information - you need the layouts to reveal any flaws in the design of these rooms. The floor plan symbols page contains all the bathroom and kitchen symbols. Strictly speaking the outdoor information is represented on a site plan rather than a floor plan. Exterior dimensions are important if you're building or adding to your home to understand how it will fit on your lot. Obviously if you’re building your home you’ll have to figure out the best place to put it on the land. 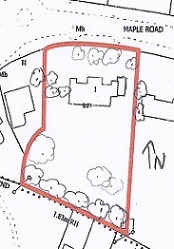 If you’re considering an existing home try and find out what surrounds the site where the home is and where the boundaries to neighboring properties and the road are. Draw boundaries and surrounding buildings or trees onto the floor plan of the ground floor. Figure out which way North is and write it onto the plan if it isn’t already there. 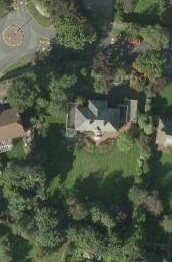 Google maps in satellite view is a great tool to use here. All of this information helps when thinking about how the floor plan fits in with the outdoor surroundings. If you're building a property or doing a major remodel find out where the drains are and where the electricity comes into your home. If you use gas where does the gas line come onto the land?